This popular café just seconds away from Coogee Beach is a prime spot to begin a day of fun in the sun. You may experience a short wait because of this but the sight of the dishes flying by encouraged us to persevere. There are a couple of tables on the sidewalk but the majority are in the single-room interior. Open for breakfast, lunch and dinner, the vibe inside is loud but friendly. Having said that, your head may not thank you if you turn up with a hangover! 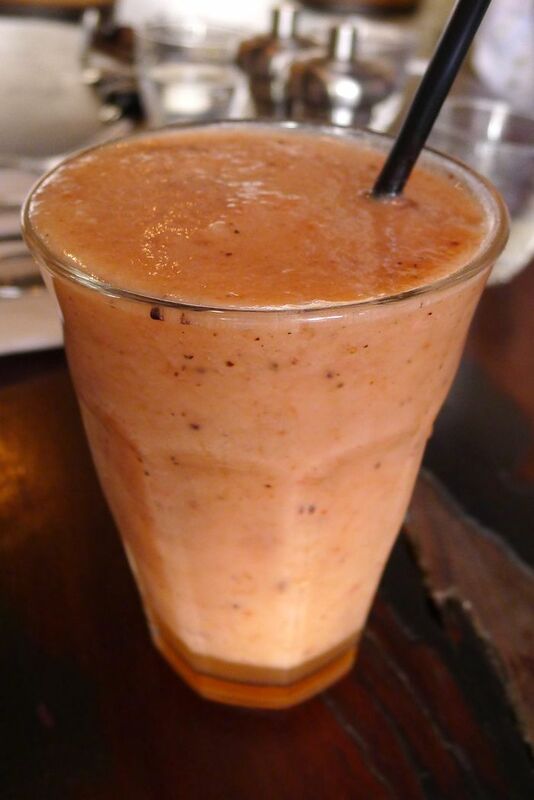 The fruit salad frappe ($6.50) has no discernible standout fruit which isn’t a bad thing, it was simply a blend of many! 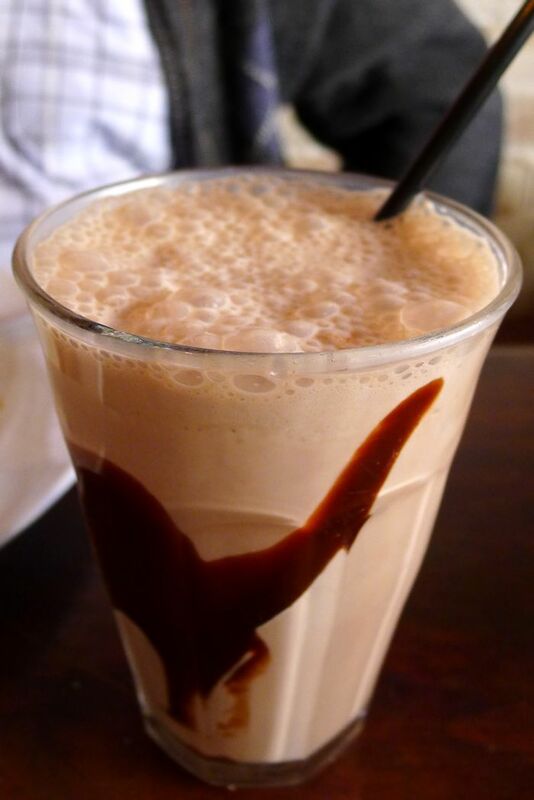 A great dairy-free start to any warm day. The other flavours available are mixed berry or mango. 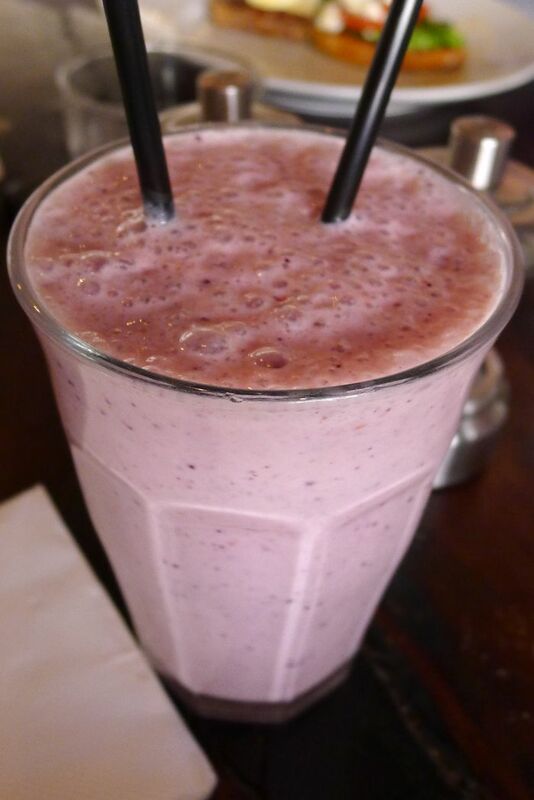 Smoothies ($6.50) are available with banana, mixed berry or mango. Not satisfied with this selection, one of my guests ordered a banana and mixed berry smoothie which was thicker than normal and tasted great. She praised it highly. Mango is also available although like the frappe, I imagine it isn’t fresh right now as it’s not mango season (yet). The chocolate milkshake ($4.50) was chocolatey enough with plenty of ice cream. Bring out the child in you with other flavours too including caramel, strawberry or vanilla. 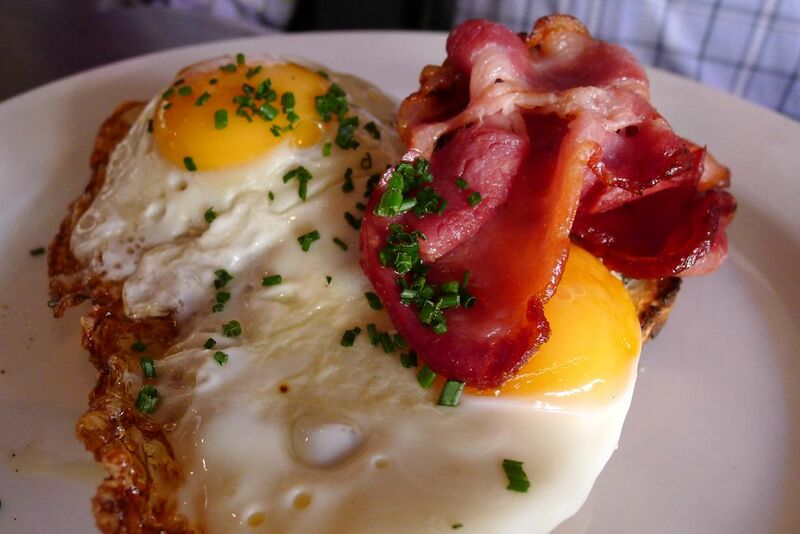 On to the food and we’ll start with the simple classic: bacon and eggs. My guest ordered the organic free range eggs ($9.50) on sourdough toast with a side of bacon ($4.50). There’s nothing really to fault here but to be honest one would hope that would be the case for a dish like this at almost any spot I review. My guest would have preferred his eggs cooked slightly less but Black Pony are happy to oblige with any particular requests you may have. The bacon tasted great and there was enough of it for a side. Speaking of sides, you have a huge range to choose from including Tasmanian smoked salmon, prosciutto ($5 each), bacon, grilled leg ham, chorizo ($4.50 each), grilled haloumi or house baked beans ($4 each) to name but a few. Perfect for customising a plate of your own creation. The Juliette ($15 or $17 with polenta and a poached egg) is a well presented vegetarian dish. 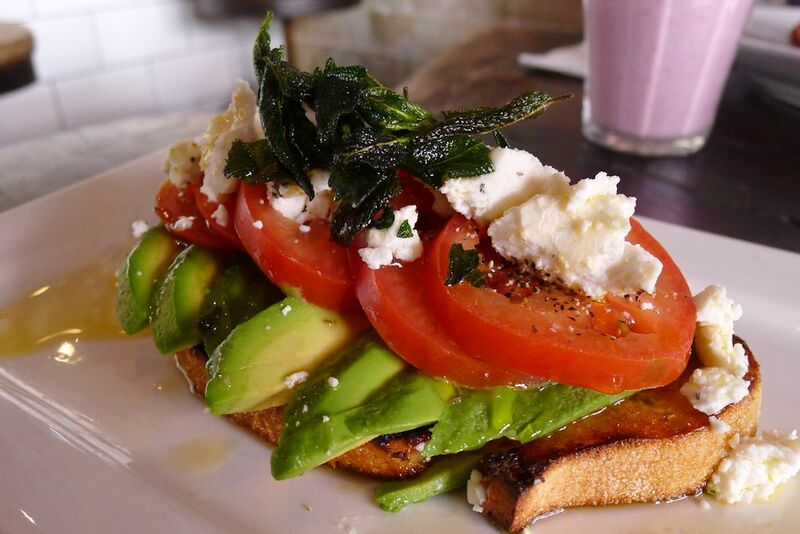 Sourdough toast, fresh avocado & tomato, goats cheese and crispy sage. This was a great variation on some ingredients that we often see together and it was done with class. Yes, yes it’s another eggs Benedict ($16.50). And no it won’t be the last I review! Now here’s a dish that we’ve seen plenty of and that can go very right or very wrong. 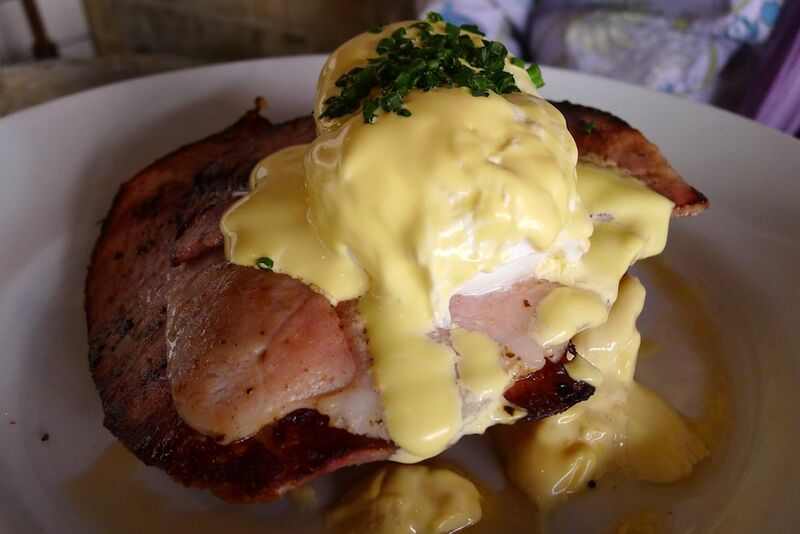 One way to start off well is some smoked, thick cut ham and a poached egg with oozing yolk. The brioche also sets this version apart. The Hollandaise was slightly too much on the creamy side for me and in need of a touch more vinegar. Overall the dish was delicious though and I would order it again. You can also order variations of this in the form of eggs florentine (spinach, $15.50) or salmon ($17.50). Black Pony does their buttermilk pancakes ($15) right! 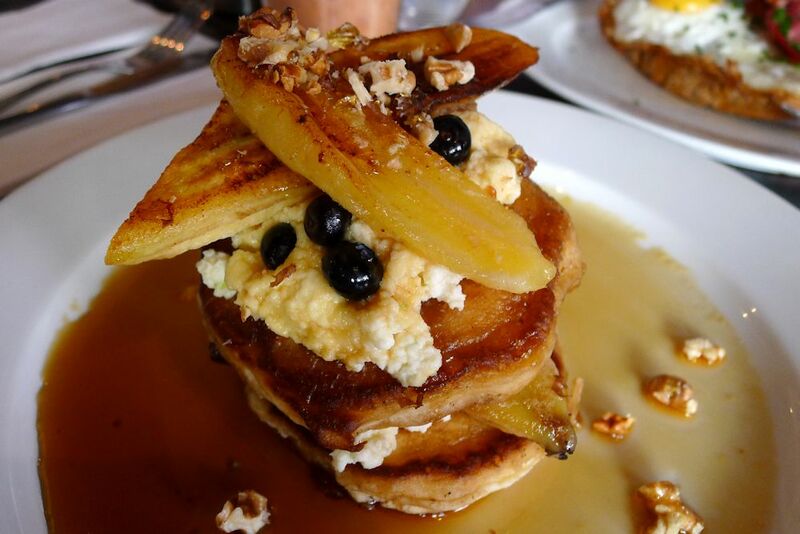 The tower is broken up by layers of smooth ricotta, fried banana, maple walnut praline and more than enough maple syrup. Fried banana is often not fried enough; the caramelisation here was spot-on. I would have liked more of the praline though. The blueberries are added for colour and perhaps the delusion that you’re eating something remotely healthy! The breakfast menu continues with many other dishes I’d like to try including fresh fruit salad with vanilla bean yoghurt and honey ($9.50), steamed asparagus on sourdough with poached or scrambled eggs, shaved parmesan and extra virgin olive oil ($16.50) or the brekky salad of grilled haloumi, avocado, rocket, roasted tomato and poached eggs with dukkah and lemon dressing ($15.50). You may notice a lack of coffee in the review. 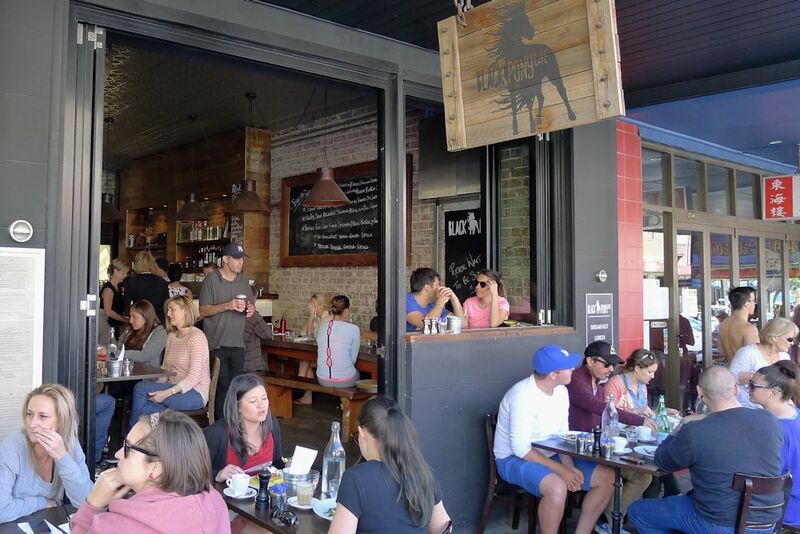 I have some quibbles with the speed of the service at Black Pony on the day we visited, an example of which is that after waiting more than ten minutes for two coffees, I cancelled the order. With that being said, I would return if I was in the area and in fact two of my guests from this review did return the next day and reported that the coffee was fantastic (and that the service was excellent). All I can take from this is that you should visit early in the morning before the crowd surges. Payment Options: CC, EFTPOS, cash. No American Express or split bills. 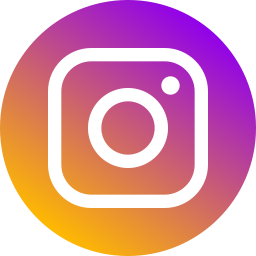 This entry was posted in Sydney - South and tagged Disabled access, Dog friendly, Free range eggs, Fresh fruit and vegetable stores close by, Gluten free options, Organic Options, Outdoor seating, Water views. Bookmark the permalink.